I don’t replay games – ever! But if I like the theme and gameplay then I will seek out mods and maps for it. That’s the main reason I play PC games instead of console versions. There are many factors that effect replayability but in this article I will only focus on difficulty settings. However sometimes there is a fine line between new features and difficulty settings. I should also mention that this piece is directed at single player first person shooters. Most SP games are released with some sort of MP option but I’m not talking about that feature. I’m specifically interested in replaying the SP part of the game. There’s little doubt that replayability is much more than changing difficulty settings. If the game lacks interesting levels, weapons and fundamental gameplay then players are very unlikely to replay the game. Before I go any further I think it’s worth mentioning randomness. This clearly has an effect on whether players replay games. That’s surely one of the benefits/advantages of multiplayer games – every match is different. It’s clearly not so easy with Single Player games because level designers spend a long time balancing enemy positions with the level layout. To suddenly change their positions would drastically affect the way the level plays. There are other things that can be randomised but I’ve yet to see a successful use of randomisation that made me want to play the game again. I recently completed Chaser and due to dying often I was constantly having to replay large sections of most levels. One thing I quickly noticed was that when I killed an enemy whether he dropped health or armour was randomised. Mostly they dropped nothing but it certainly made a change to knowing exactly what would happen. Some games come equipped with an adaptive setting, meaning the difficulty changes based on your playing standard. Personally I’m against this because just because I’m playing badly today doesn’t mean I want the game to be easier. Unreal Tournament has this option and I have in the past played for a little while on this setting and see what it has decided is my current ability and then set it to one higher. “I’m not to big on adaptive difficulty. I want it to be challenging at times and easy when I do something brilliant. I want to feel just how good I am and know what difficulty I’ve beaten”. I specifically delayed finishing this article until after the release of Half Life 2 because I was hoping that this eagerly-awaited game would inject new life into the issue of difficulty settings. Unfortunately this does not seem to be the case. Although, at the time of writing this, I am only about half way through there doesn’t seem to be any innovation in this department. Currently most games have three difficulty settings and some four. The accuracy of your enemies’ shots increase. The amount of damage per shot changes. There is less health available. There is less ammo available. There are more enemies spawned. As you can see it’s either more of something or less of something else, not very creative really. Another point to mention is that of locked settings. Simply put, you cannot play the level above your current setting until you have beaten the one you are playing. This feature invokes a certain psychology on the part of the player and you either respond well to this challenge or you don’t. To some it’s a challenge, to others, me included, it is a needless limit that provokes negative feelings. Before I started writing this piece I posted a simply survey/poll on a number of forums to gauge the feelings of other players. 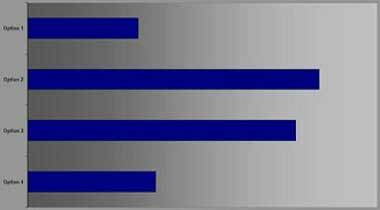 Unfortunately not all forums allowed the creation of a poll (or I simply didn’t see the option!) and I had to rely on simply asking questions in a post. In retrospect I should have create a survey on a 3rd party website and directed users to that. Ah! The benefits of hindsight! These results should not be considered too representative simply because of the lack of total replies and the limited options of answers available. What I’m trying to say is that the poll wasn’t very scientific! After you have completed a game do you replay the games on other difficulty settings? Option 1. Yes, I start on the easiest and work my way through all difficulty levels. Option 2. Yes, but only on the higher levels than when I completed the game. Option 3. No, why bother? Option 4. No, because I always play at the hardest level. As expected the comments provided some interesting insights into players motiviation and feelings. Here are a few comments that I feel nicely express different points of view. Some comments have been edited for clarity, spelling and grammar. I find this last point very interesting. What if a developer released a game that was always on the equivalent setting of Hard Would this encourage players to preserve to finish it? They would probably have to take the ability to cheat away otherwise there would be no satisfaction in completing it. Why do players replay games? Some games will be replayed due to nostalgia, those games are often one of the first games you played and invoke the same feelings you had when you first played the; awe, excitement, wonder etc. Others replay games because a sequel is about to be released and they either haven’t played the first game for a long time. A good example of this is Half Life; you only need to look on a few forums to see threads started by players who have started to play HL1 in readiness for HL2. The inherent fun of certain levels or enemies is another reason to replay games. The way a weapon works or the challenge of an enemy is often reason enough to fire up that old copy of Quake 2. Another recent development is perhaps the wow factor. Watching the rag-doll physics can be mesmerising and attempting to create spectacular display could provide some players with enough motivation. However the newest games always have something better so perhaps this feeling is too short lived. One thing that seemed to come out from my simply polls was that players very rarely started at the easiest difficulty setting and worked their way through to the hardest setting. They either went up from their normal starting level or else that simple played at the same difficulty level again. Other just played particular levels again hoping to either reduce the time taken or some other form of performance improvement. So, now we know what currently happens let’s talk about what could happen. I won’t present many suggestions here because to make a list of ideas would be either too game specific or too vague. There must be hundreds of options depending on the game theme and setting. Let’s take Weapons as a example. All have probably been used in games before but were they part of the difficulty settings? You often see them in the Other tab in the Options menu. You may also consider them to be features rather than difficulty settings but that leads us to another point: Should higher difficulty settings include more features? I’ll discuss this point later. Back to the Weapons example. Below are possible options that could be included in a game to make it more interesting/realistic. I recently played a mod for Half Life called Black Thunder. Unfortunately there was a serious bug and they had to release amended maps from a certain point. From this point onwards I lost my HUD. At first the lack of information regarding my health and weapon status was very frustrating but ultimately I found the experience to be both a challenge and more enjoyable than if I had the HUD. There could be other ways concerning information given to the player that could increase the difficulty level. The lack of signs or room labels is one example. One problem is that whatever you change regarding the difficulty settings, the level itself remains the same. The enemies follow the same path and the objectives remain unchanged and lastly, perhaps most importantly, the geometry stays the same. I know there have been attempts at randomising walls and doors positions but if it was that simple level design could be automated. One possible solution is to have different areas accessible based on the difficulty setting. This though means the levels have to be bigger with the possibility that large parts of the level may never be played by most players. I think SP game developers need to take a leaf out of the MP developers design book and give more control over certain elements of the game to the player. I propose the introduction of a custom difficulty setting. I will explain in more detail the ideas a little later but first I want to mention the benefits and reasons for introducing such a system. It gives more control to the player, making them feel that the developer has considered their needs. There’s a greater chance the game will provide the right level of challenge. Sometimes Hard is too difficult and Medium is too easy. The Tweak factor. Whilst not every PC games player is a tweaker, there are a large number who spend a long time adjusting either their hardware or their software settings. By adding a custom setting developers can tap into this psychology. The system can have a built in performance recording system – more about this later. It would encourage and allow players to make gradual changes to the settings as they improve. Because the changes would be independent this may encourage players to experiment with different settings. By entering this section the player would be able to change a variety of settings. (What I wanted to do was create a working model but unfortunately my coding skills weren’t up to the challenge.) There would be a number of tabs, the obvious ones being Weapons, Enemies (Including AI), Health and Items. Each tab would have sub tabs. 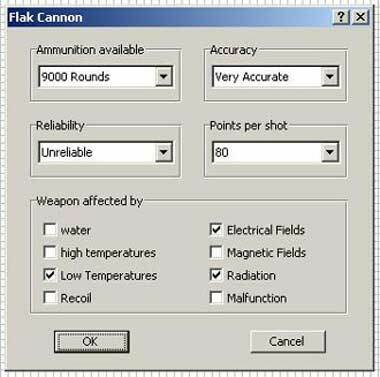 Below is an image of a simple dialog box that would allow players to customise each weapon’s settings. Of course my example is very generic and every weapon may have different options. The idea could be extended to almost every area of the game but a balance would need to be maintained between usability and details. A simple option would be to provide Basic and advanced menus. In my mind’s eye I see players being able to reposition enemies and weapons etc but that’s perhaps too much detail and also can be accomplished via the Editor of most games released. Each change made to the custom setting would effect an algorithm (or some other method) that would provide the player with a final Performance Rating at the end of the game. This Performance Rating could be as simple or as complicated as the developer wants. Items displayed could include percentage of enemies killed, lives used, secrets found and shots fired. Ultimately I believe a Final Score should be produced, I’ll explain why later. In fact an Unreal Tournament single player mod called Operation Na Pali had detailed statistics available but I never paid much attention to them because I was having enough trouble just completing the mod! is a huge incentive to go back and look for the ones you missed. Now this may not seem like replayability but it is, it’s just on a macro scale. Although I would find it too frustrating perhaps this information could be presented, with the easy option of printing, at the end of the game. Not necessarily split into individual levels but just totals. Knowing you missed most of the secrets but not knowing exactly where would drive me crazy but for others this could be a real challenge. If the custom settings could easily be exported and imported directly from the game onto the developer’s or publisher’s website then players could enter there result into a league table. That is why the production of a Final Score would be so useful. It would give the players a way of directly comparing their performance with other users irrespective of the exact custom settings used. Simple games can have enormous replay value. We’ve all played games like Tetris to death but we still keep at it because we want to beat our previous score or do it without losing a life. I might be tempted to replay games if there was a running score kept that I could compare with other players or some other system where you performance is recorded. Look at the recent success of the Yeti series of games. I wonder how much of the popularity has to do with the fact that you can post you scores on the web and compare them to others? There must be many marketing ideas that could be used, for example monthly competitions, specialised settings competitions. This may be a way for Single Player games to enter the Cyber Games. Not strictly connected to difficulty settings but being able to make and play custom built maps and mods has certainly contributed in some way to replaying games. I’ve never really got into swapping weapons in SP games and then replaying them. In fact I don’t even know whether I can or not. Take Half Life; are there packs available that allow me to replace all the weapons with new ones? Having the option to replay games with new enemies or weapons would certainly attract me. In fact I’m surprised developers haven’t released upgrade packs that include new vehicles, weapons and enemies. These seem to me almost as important as new levels. I would certainly pay, if it were reasonably priced, for a retail pack that allowed me to replay an old favourite game with a new twist. Of course there’s more to it than just making great weapons, there’s the balance between the enemies and weapons and also how both fit into the story. It’s just more complicated than making a weapon for an MP game. The inclusion of a custom setting connected to the published statistical recording of performance has, to my knowledge, never been used in single player games. Of course if a game lacks interesting levels, weapons and fundamental gameplay then nothing developers can do will make players replay the game! It may seem that I am saying that the more difficult a game becomes the more realistic or complicated it should be. Whilst I haven’t purposely advocated this point of view it may be that it is a natural consequence. If we think about the most popular SP FPS games, Half Life, Doom, Quake and Unreal, they all have vibrant modding communities but as more and more games are released with editors there has to be something that makes players/modders stick with a particular game. It is of course a vicious circle, the more people involved in a gaming community the more people want to join it. Perhaps the question is what starts this snowball effect? But that’s a whole new post! As the game developers seem to consolidate into large corporations, replayability of older games may be more important for sales of new games than we currently give credit for. You are more likely to purchase a game from a developer/publisher that makes games with a long-playing life than others.